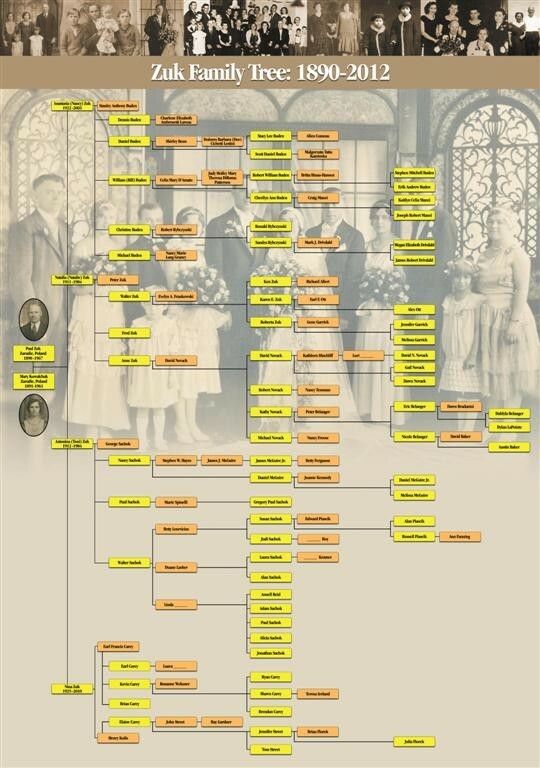 The below Zuk Family Tree traces the family's lineage from 1890, when Paul Zuk was born in our ancestral hometown of Zarudie, Poland, through 2012. Paul and Mary (Kowalchuk) Zuk had four daughters; those four daughters had 15 children; those 15 children had 30 children of their own; and those 30 children, in turn, had another __ children. That fourth generation is today lovingly bearing a fifth generation, Paul and Mary Zuk's great-great-great-grandchildren - the youngest of which is Dayne David-George Belanger, born October 11, 2012. To download a larger PDF copy of this family tree for easier viewing, simply click on the family tree image below.